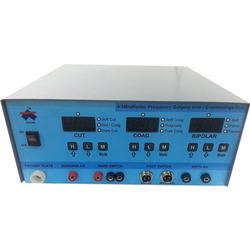 Leading Manufacturer of rf surgical unit and radio frequency cautery from Ahmedabad. We are amongst the leading names in the industry, offering world-class array of radio frequency surgical unit. our entire product range is abrasion resistant and is functionally updated. In the surgical suite, clinic, office and outpatient surgery centre, the ime sseu 400b generators provide a cinsistently high level of performance and saftey. the ime sseu 400b accepts all standard accessories to help meet the surgeon’s needs, in a wide range of general procedures and in specialities, including gynaecology, laproscopic, neuro surgery, orthopedic, urology(under water) and plastic reconstuctive surgery.